A subpatch, assigned a midichannel (other than ch1) in it's settings (eg. "2") will receive the control messages on the assigned channel when run standalone, but not when run as a subpatch. Anyone experience or ideas with this? 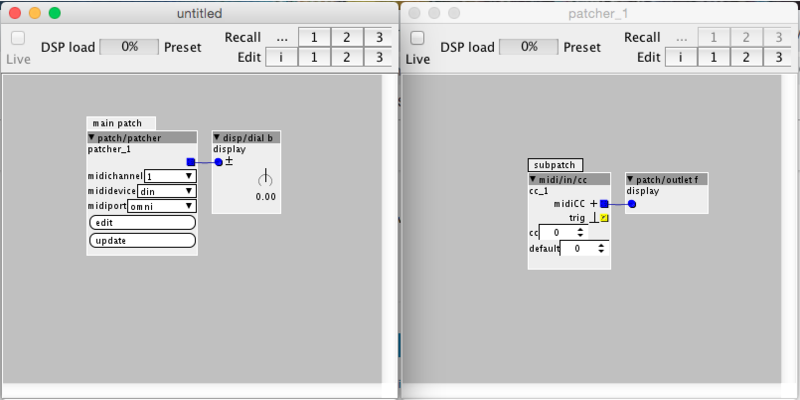 it has a midi/cc object, where you can adjust the channel at runtime. this is not really recommended, but you can test if it works with this object to debug further. actually the "parameter on parent" dials are not updated which made me believe there was no change. yes, i would think of that as a feature rather then a bug. you assign cc's only in the main patch, because that is what you will see when you open it up. but i agree it is not fully intuitive... glad you got it "working"
the settings in the menu are overriden by the selector, so no need to worry about those. 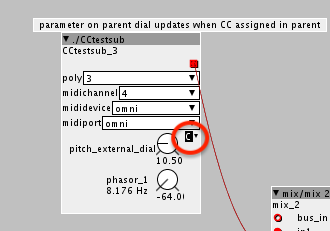 If you want to use cc inside subpatches and have them channel dependant, this object here works fine. This get's me a long way. What is the "midiport" actually? Well, everything in the main patch is only assignable to ONE channel. All dials represented in the main channel, even though they are located on a subpatch, which is assigned to another channel, they will we assigned to the main patch channel. If you want several channels, I think the way to go is doing it the way I suggested. Then you can, as you describe, simply just copy the subpatch and change the midi channel and you have another setup on a another channel. midiport refers to devices that have more than one port, i.e. some usb-midi synths or controllers. essentially this allows to send on more then 16 channels from those devices. Dont have any devices with more than one port, so never needed to take that into consideration.